The Black Balsam area includes some of the most spectacular mountain balds in the Southern Appalachians, including Black Balsam Knob, Sam Knob, and Tennent Mountain. These treeless mountaintops draw people from afar due to their sweeping views and alpine appearance. Goldenrod and Mountain Ash on Black Balsam, some of the first signs of fall in late August. The Flat Laurel Creek trail winds through the valley below the balds. In addition to these balds, trails in the Black Balsam area lead down into the Flat Laurel Creek valley with its dark forests, streamside meadows, and cascading waterfalls. 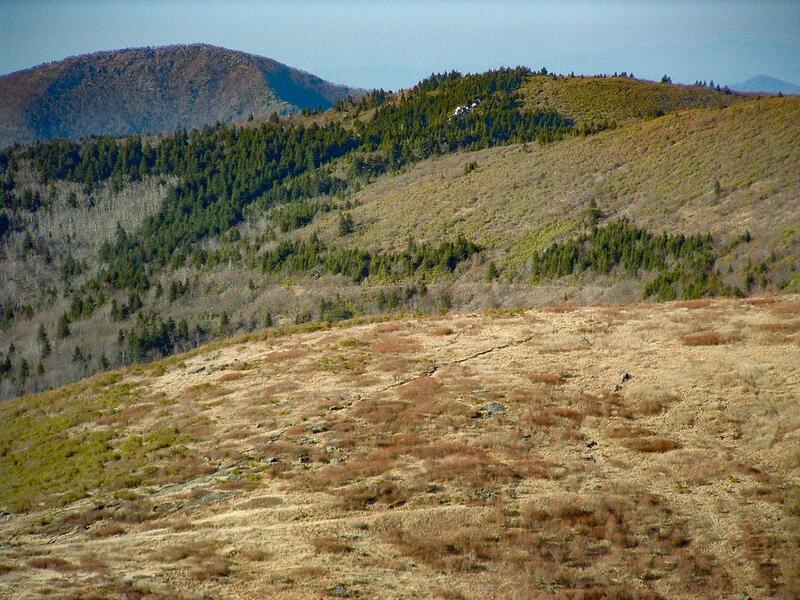 And although many of this area's points of interest are just outside of its boundary, Black Balsam is also a popular gateway to the Shining Rock Wilderness Area to the north. Many people choose to start their journey into the wilderness from here. The hike to the summit of 6214 ft Black Balsam Knob is via the Art Loeb trail, 0.7 mi from the Blue Ridge Parkway on Black Balsam Road (FS 816). 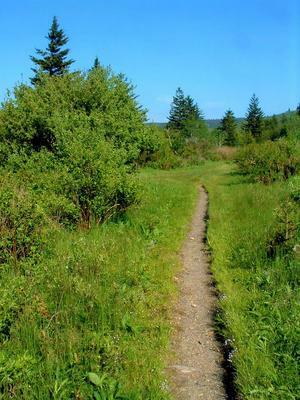 There is a sizable parking area for the trail along the road, but the hike is so popular that the parking often overflows on weekend and summer days. Arrive early for the best chance at finding a parking spot, and to be off the mountain by the time the inevitable summer thunderstorms form over the peak. You will not be alone on this hike. 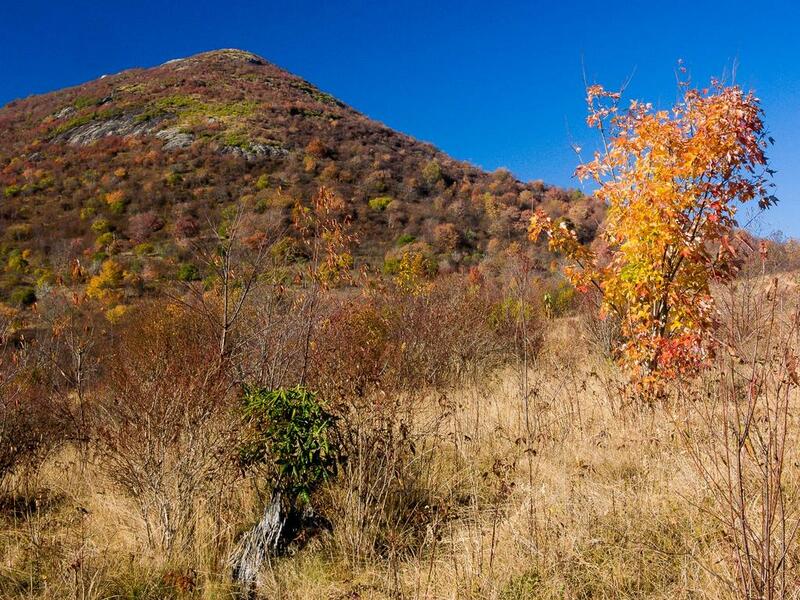 Take the Art Loeb trail to the north (right side as you drive in) to reach Black Balsam Knob. It's a walk of about 1/2 mile which gains a total of about 425 ft in elevation. It passes through a spruce forest near the beginning, then over a lower summit first, and through the open, grassy and rocky mountain meadows that makes this area famous. This short hike is highly recommended! 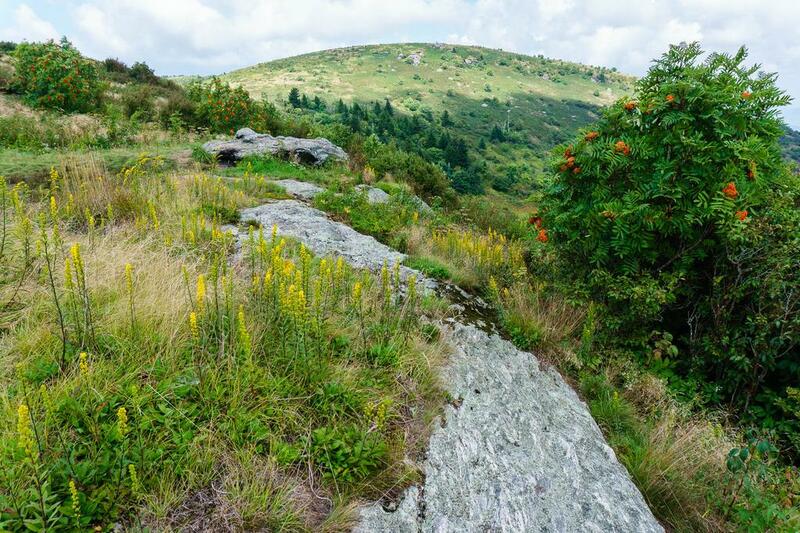 You can continue along the Art Loeb trail after the summit of Black Balsam Knob to reach the summit of Tennent Mountain, which is another of the prominent open bald peaks that make the area so well loved. An alternate route to the summit is via the Art Loeb Spur trail from the parking area at the end of Black Balsam Road. It's a bit steeper and climbs more overall, but it's also a nice hike and useful if the upper parking area is full. Turn left at the top to reach the summit of Black Balsam Knob. An alternative to hiking Black Balsam Knob is Sam Knob, a bit longer hike but with more varied scenery. The quickest way to Sam Knob is from the parking area at the end of Black Balsam Road, 1.3 mi from the Blue Ridge Parkway turn-off. That's the Sam Knob Hike and one of the best in the region - better than Black Balsam, in our opinion! 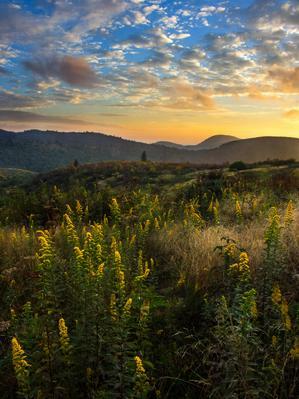 Sam Knob rises above the meadows near Flat Laurel Creek in autumn. From the end-of-the-road parking area, the Ivestor Gap trail skirts Black Balsam Knob and makes the fastest way to reach the Shining Rock Wilderness boundary and Shining Rock itself, after a mostly level hike of just under 5 miles one-way. You can also take the Art Loeb trail across Black Balsam Knob for a more scenic route (but with more ups-and-downs). Combine them for a great loop hike. Aerial tour of the Black Balsam area. Goldenrod grow in the meadows below Black Balsam Knob. To Shining Rock: Art Loeb Parking → Art Loeb Tr. over Black Balsam & Tennent Mtn. → Ivestor Gap Tr. → Black Balsam Rd. Flat Laurel Creek: Ivestor Gap Parking → Sam Knob Summit Tr. → Sam Knob Tr. → Flat Laurel Creek Tr. This is just an overview of trails available in the Black Balsam Knob area. For details on each individual trail, see the Black Balsam Knob trails page. Or, you can get detailed information on the best hikes in the Black Balsam Knob area (which use more than one trail). Here's a map of the Black Balsam area so you can see how everything fits together. For more maps, including printed publications, see our Black Balsam maps page. Dispersed camping is allowed anywhere on National Forest property accessible from the Black Balsam area, except within 500' of a road or in a designated closed area. Bear canisters are required for food storage in the Black Balsam and Shining Rock areas. All bear canisters must be commercially made; constructed of solid, non-pliable material manufactured for the specific purpose of resisting entry by bears. Excellent campsites can be found (not made!) on top of the balds (but beware of harsh weather), along the Art Loeb/Mountains to Sea Trail South of Black Balsam Road, along the Flat Laurel Creek trail (where you will generally have access to water), and toward Sam Knob on the various trails (but not in the mowed wildlife meadow). Please avoid any and all trampling of the vegetation, leaving of trash, enlargement of campfire rings, or cutting of standing wood in this area! Remember, campfires are not allowed within the Shining Rock Wilderness boundaries - bring a camp stove. There are no developed campgrounds in this area. The closest would be the Mount Pisgah Campground which is located South on the Blue Ridge Parkway, the Davidson River Campground which is located South on the Blue Ridge Parkway and then East on US 276, or the small Sunburst campground which is located North on the Blue Ridge Prakway and then West on NC 215. View across Tennent Mountain toward Shining Rock from Black Balsam Knob. Lodging is available in the nearby towns of Brevard, Waynesville, or Asheville, all within about one hour's drive to the Black Balsam area. This trailhead area is accessed via Black Balsam Road (FS 816), off of the Blue Ridge Parkway at milepost 420.2. There are two main parking areas along Black Balsam Road: one halfway to the end, at the gap where the Art Loeb and Mountains to Sea trails cross. The other is at the end of FS 816 about 0.5 mile past the gap, where about half a dozen more trails start. Take the Blue Ridge Parkway South past Mount Pisgah, US Hwy. 276, and Graveyard Fields. Just past milepost 420, look for the road to Black Balsam (FS 816) on the right. It's about 0.8 miles on this (semi) paved road to the first parking area at the gap (Art Loeb/Mountains to Sea Trail crossing), and another 1/2 mile to the parking area at the end of the road (the Ivestor Gap trailhead).